A nice, open course. Some good placing of bunkers and ponds. A lot has happened since the last TSG foray on this interesting course. Suffice to say that the people tasked with restoring the course to playable condition have liquidated and the care and maintenance is now back with the leaseholders. We booked online to take advantage of twighlight rates - the web site could have advised that the condition of the course wasn't perfect and that work was scheduled but not yet carried out. Pro-shop was Ok however the card machine wasn't working on the day we picked... which meant a trip to a nearby cashpoint.. The clue on arrival was the practice putting green - lumpy and bumpy and obviously worse for wear. Those that remember Nazeing in the wet wouldn't have recognised much of this course... all dry. here's the downside though, greens I would regard as pretty much unplayable - although I did start to make some lucky putts on the back nine. Majority of bunkers appeared GUR (those that weren't were inconsistent - too much or no sand). Fairways in need of cutting and 'rough' needed tending. To be fair discussions with greenkeepers revealed the scope of problems and Sunday was the first day that they could actually get out and cut the new grass on many of the greens. It looked like the previous maintainers had allowed things to slip (a lot) and the course is in need of general TLC (even down to replacing signs and markers). On the plus side - there looks to be commitment from the leaseholders to put things right and the promise was there. It would be nice for the web site to be 'adjusted accordingly' to identify the relative condition of the course and perhaps take into account the amount charged for twilight green fees. This is an interesting - not too challenging course layout, with opportunity to do OK once the maintenance has had time to make an impact. Until otherwise notified I wouldn't recommend this as a course for golf purists, let's hope that remedial action is timely enough to ensure a rapid return to playability. Course is easily found, with adequate parking space and driving range facilities. Clubhouse is fine, we didn't eat there this time. Locals were reasonably friendly if a little slow in getting around (perhaps due to the condition of greens and fairways - and tee boxes which are still as bad as ever). Nazeing has good facilities. 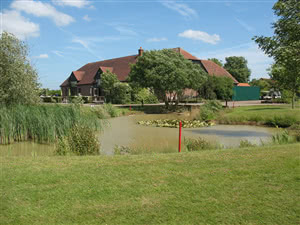 A nice clubhouse with friendly staff, a good Pro Shop and practice areas. There is a putting green and a driving range. The course itself is not bad. The tee boxes could do with some TLC and the fairways were not bad. Greens were decent and fairly true. The worst part of the course is definetly the bunkers. Some were GUI and the others that were not should have been. Why is it so hard to get a decent bunker nowadays?!!!! All in all I enjoyed the round and would go back. Secured via Groupon voucher (£12 for 36 holes), so fantastic value for money. Tee boxes in desperate need of some TLC however the remainder of the course was in good condition. The greens are starting to burn up, however I put that down to the current weather. There are signs of what a fantastic club this could be but as is the way at present they need more funds. Will go back as thouroughly enjoyed the day and parkland nature lets you off some less than accurate shots! Nazeing Golf Club was very welcoming, catering facilities excellent; the course is an interesting challenge though was playing very long for me as the course was 'waterlogged' after severe overnignt rain; greens were also partially adversely affected accordingly. I would love to play it again sometime under 'fairweather' conditions. This venue was great value for money on the day. Not a bad course. No big surprises, and going with that, no really memorable holes. I'd look at a revisit when the British rainy season (?) was not with us (when??) and hopefully the bunkers would not be GUR. Not overly testing, but not every course needs to be.